A progressively drying climate punctuated by variable wetter episodes may have precipitated the transition from our hominin ancestors to anatomically modern humans, according to research published on Oct. 8 in the online edition of the Proceedings of the National Academy of Science (PNAS). Since the discovery of a rich assemblage of human fossils as well as stone tools and other archeological evidence in the rift valley of East Africa, a region often referred to as the cradle of humanity, scientists have attempted to piece together the complex puzzle that is the history of our human origins, including the environmental context of that history. 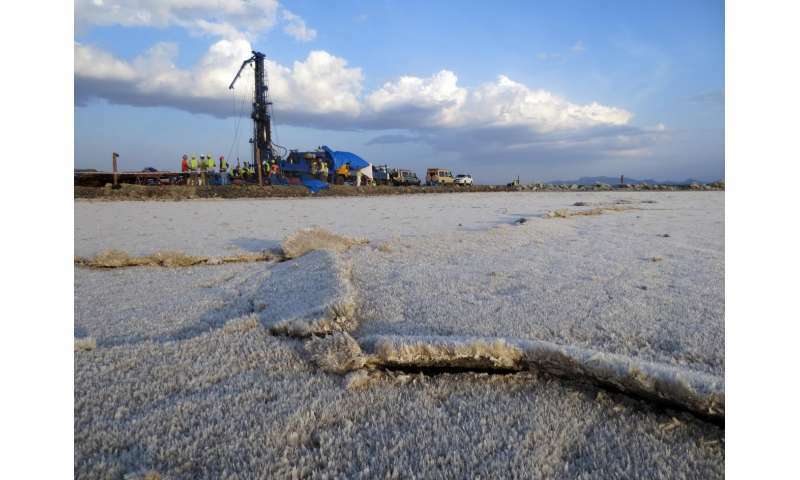 The study, based on lake sediment cores, is the first to provide a continuous environmental context for the diverse archeological evidence recovered from nearby localities in the rift valley basins of southern Kenya. 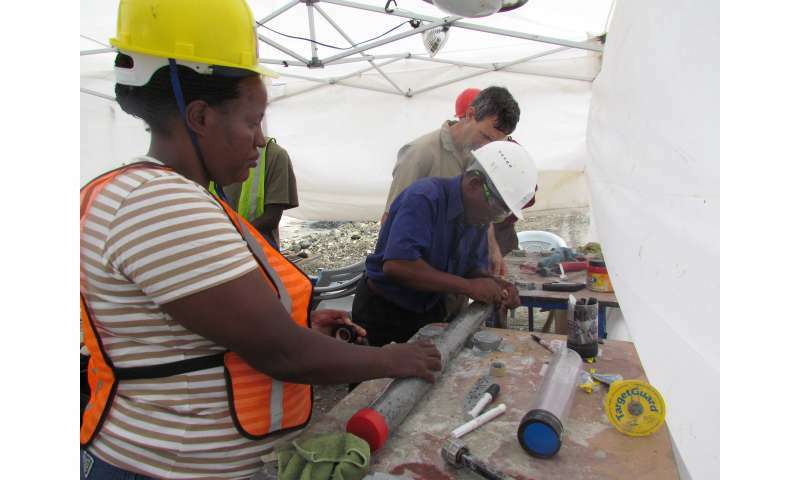 The cores were sampled from Lake Magadi as part of the Hominin Sites and Paleolakes Drilling Project, or HSPDP, which is directed by University of Arizona professor Andrew Cohen. 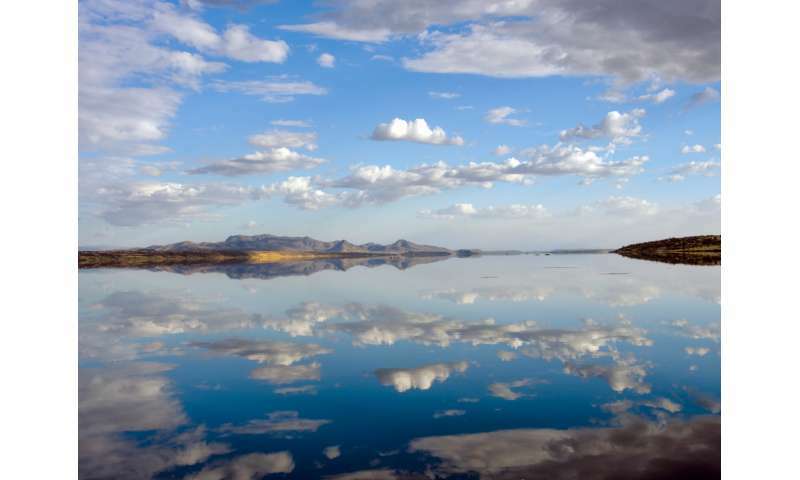 Lake Magadi, a shallow, periodically dry lake, is close to the Olorgesailie basin in Kenya, one of the most productive sites for archaeological evidence of human evolution in Africa. The authors suggest that the profound climatic changes may have been driving forces behind hominin evolution, the origins of modern Homo sapiens and the onset of the Middle Stone Age. While previous hypotheses have related hominin evolution to climate change, most prior studies lack regional-scale evidence for a link between environment and hominin evolution, the authors write in the paper, "Progressive aridification in East Africa over the last half million years and implications for human evolution." According to the study, a trend toward intense aridification in the area began 575,000 years ago. The change, not previously documented in continuous continental cores from East Africa, corresponds with faunal extinctions and a major transformation in stone tool technology documented in the Olorgesailie region. "Much evidence for human evolution has been gathered from the area, but linking those records to detailed environmental records was missing until now," said the study's lead author, Richard Owen, of Hong Kong Baptist University. "There is a big gap in the records between the last Early Stone Age tools 500,000 years ago and the appearance of Middle Stone Age tools about 320,000 years ago. Our results plugged that gap with a continuous environmental record." A critical transition occurred sometime during this gap, a period for which archeologists have unearthed evidence of a leap in early humans' abilities to make, use and trade stone tools. The cores from Lake Magadi provide the first detailed link between climate change and events known from the region's archeological record. "We have known for a while that the climate at the time was very varied, but the key here is that the records are in proximity to the archeological evidence for this transition," says Cohen, a professor in the University of Arizona's Department of Geosciences. "The older stone tools found at Olorgesailie did not change much between 1.2 million and a half-million years ago. And suddenly, after 500,000 and before 320,000 years ago—we don't know exactly when, but in that timespan—there was a critical transition in archeology when tools became more sophisticated and were transported over longer distances." At the same time the lake core records point to the climate becoming drier and more variable, there is evidence elsewhere in Africa of the appearance of modern Homo sapiens, prompting much speculation whether the two are connected, Cohen said. "Whether the evolution of bigger brains goes hand in hand with new toolkits is not entirely clear," he said. "But the earliest modern Homo sapiens fossils from Morocco date back 325,000 years, the same time we see this transition of tools. And both happened around the same time that our core record indicates severe drying very close to the archeological sites." The deepest core drilled at Lake Magadi reached 200 meters (650 feet), penetrating all sedimentary layers down to the volcanic bedrock of the lake. The core samples, each about 10 feet long and 2 1/2 inches in diameter, are cut into manageable 5-foot segments, packaged and air-freighted to the National Lake Core Facility at the University of Minnesota for curation, analysis and storage. According to the hypothesis of variability selection, a rapidly changing environment creates selective pressure that forces species to adapt to rapid change, Owen said. Under that scenario, the larger brains of anatomically modern humans would have allowed our ancestors to adapt quickly to an increasingly less predictable world. "Now we have evidence that at the same time the toolkits were changing, the mammal fauna changed and the climate became more arid," Owen said. "So you have a series of coincidences that makes you think, 'This could be real.' Now we can say when the environment changed and then compare that to the archeological evidence of the region." Drilling at other nearby sites by HSPDP has been completed as researchers gather more of the region's climate data to continue studying the importance of environmental variability in the course of human evolution. What in God's name does this have anything to do with evolution? This article is pure nonsense. Built upon a false theory, and continuously fed by garbage. The article is more describing how environmental changes spurred technological changes. Which, as you point out, is technically NOT evolution as we know it in the biological sense. I believe the contributors might be trying to make the connection that those same environmental changes prompted evolutionary changes in the regional humans the somehow increased their capacity to improve their tools. Might be a bit of a stretch, maybe, but then I'm not trained in this field, so... take that as you will. what bart wills, is that reality stop interrupting his comatose state with uncomfortable facts. Are you having a claustrophobic attack, by any chance? It doesn't have as much to do with evolution, as it has to do with the chance to talk of hominins as the alleged ancestors of Homo sapiens. But notice that these archaeologists never, ever can find that elusive transition from hominin to sapiens, as though a foot bridge once existed linking 2 mountaintops together, but now the footbridge can't be found. So it is with the bones of the interim life form that had been the bridge between the two genera. It is useless to refute any such relationship, since most humans prefer having had chimpanzees, gorillas and monkeys as part of their ancestry. Nothing more noble than such an ancestry will do. I wouldn't bandy that about, else it might be misconstrued as being disrespectful. oh segue, disrespecting drunken, incompetent deities is my job. And segue, considering your narrow-minded prejudices against the Scientific Method? There will never be enough empirical evidence to overcome the concrete block between your ears.